Richard Widmark's bravura debut as snickering gangster Tommy Udo, and particularly his infamous encounter with an old woman in a wheelchair, enjoys such pop cachet that the movie itself has been somewhat underrated. More's the pity. Henry Hathaway's third entry in 20th Century-Fox's series of post-WWII thrillers is just about the best of the bunch. These films incorporated the semidocumentary techniques and wondrously persuasive on-location shooting Hollywood learned from Italian neorealism and the wartime filming of some of its own best directors. Kiss of Death is more fictional than documentary in thrust, with a solid script by ace screenwriters Ben Hecht and Charles Lederer. But that only makes its imaginative, atmospheric use of real places and spaces--e.g., a superb opening robbery sequence in a New York skyscraper--the more remarkable. Henry Hathaway's 1947 film noir "Kiss of Death" had many highlights such as excellent New York locale cinematography however uneven acting performances downgraded the film to just short of classic status. Victor Mature while rough and tough in appearance playing career criminal Nick Bianco, ruins that portrayal with a too often wooden and ineffective acting performance. The movie begins in terrific fashion with Mature and his crew committing a jewelry heist in a New York skyscraper. Their escape from the 24th floor is frought with tension evident in the faces of the criminals due to a slow moving elevator with too frequent stops. A rope bound employee manages to set off the alarm and Mature gets wounded and apprehended. Unfortunately the action tails off from this point forward. Sympathetic asst. D.A. Louie DeAngelo played nicely by Brian Donlevy realizing Mature is a family man with two young daughters offers him a deal if he gives up his partners in crime. Assured by oily shyster lawyer Earl Howser played by Taylor Holmes that his family will be cared for, Mature refuses to turn rat and gets sentenced to 20 years. Mature's tight lipped stance is admired by psychotic young gangster and fellow inmate Tommy Udo played memorably in a breakout role by Richard Widmark. Three years pass and Mature learns that his wife has committed suicide and his kids placed in an orphanage. Mature gets a message to Donlevy that he's now willing to snitch. The high price of parole involves setting up Widmark, who is being tried for a murder rap. Widmark's character Udo goes through the film snickering as he dishes out violence displaying a total disdain for humankind and an unpredictable hair trigger temper. "We're going to have lots of fun", is a sentiment of Tommy when talking to Nick about his family, and the fun he's talking about is torture or death. If you enjoy the old gangster movies with George Raft, Edward G. Robinson, James Cagney, and Humphrey Bogart, you will love this movie. A true classic that has been overlooked. Victor Mature is mainly known for his hero roles in the epic movies like "Samson and Delilah" or "The Egyptian". Here there is no black or white but more grey as he starts out as a criminal that wants to provide and protect his family. When he finds out that his family isn't being provided for by the mob he decides to turn informant. Once they know he has ratted on them, he is as good as a dead man. Mature, Donlevy, and Gray are good, but Widmark steals the show with his giggling over the top psychopath performance as hood Tommy Udo. Right up there with Cagney's performance in "White Heat". Another lousy transfer from Fox! Does anyone at Fox bother to look at their DVDs before they are released to the public? Just like with Fox's mediocre release of Mark of Zorro, starring Tyrone Power, in Kiss of Death there are compression artifacts -- check the bars on the holding cell when Brian Donlevy is talking to Victor Mature. Yet this is a dual-layer disc! As well, the print is >bad<. Notice the walls when Richard Widmark climbs to the top of the stairs prior to the film's most famous scene, as well as the walls in the room before he ties up the old lady and pushes her down the stairs -- there are what look like water blotches on the print. Terrible! The obnoxious ad for video piracy at the DVD's beginning accompanied by loud, ugly rock music also doesn't make a good impression. I won't go into giving a synopsis of this movie, others have already done so quite well. I'm a film noir buff and "Kiss of Death" is certainly among the film noir classics. This film made Richard Widmark a star and is, without a doubt, the best role Victor Mature ever played in his career. Brian Donlevy, is probably more well known for playing characters on the wrong side of the law, but does a fine job as the DA in this movie. This is film noir at it's best. Other highly recommended film noir classics: "Double Indemnity", "Laura", "Murder, My Sweet", "The Killers" (Lancaster), "The Big Sleep", "Out of the Past", "Kiss Me Deadly", "The Big Heat", "The Postman Always Rings Twice", "The Killing", and "The Asphalt Jungle". The special atmosphere of film noir often rests on darkness, imperfection, and crime, but also applies occasions with ambiguous situations where morality is not simply black and white. In the beginning a narrating voice reveals that Nick Bianco (Victor Mature), a criminal, has continuously tried to exit the criminal career. However, his past continues to haunt him, as negative biases towards criminals often affects peoples feelings, and it has kept him unemployed for a year. The robbery was his only way back to financial redemption while providing the necessary means for his family and two daughters, but his escape is not successful as the police catch him. Extremely striking is the escape scene in the beginning of Kiss of Death (1947) after Nick and his partners attempt to flee the crime scene. Calmly they enter an elevator on the 24th floor where they robbed an upscale jewelry store. However, the calm is a pretend cool, as the visuals of the scene suggest apprehension and panic in their faces while the elevator slowly descends. The elevator induces a profound claustrophobic atmosphere with the large crowd entering and exiting the tight space. In addition, the repeated stops on almost every floor on the downward journey augments the suspense, as the audience anticipates the long arm of the law to enter the elevator at any time. The descent also possesses strong symbolic value in regards to film noir, as it sends a signal of looming tragedy. The combination of the escape scene and the opening narration leaves the viewer sympathetic towards criminal Nick, even as he refuses to cooperate with the police in order to have his sentence reduced. His refusal to cooperate with the police rests within the criminal code by which he lives, as nobody snitches on anyone. Warmly he welcomes the prison sentence, as he has been told that people will take care of his family. However, in jail he finds out that something wrong has happen to his family, and promises has not been kept. This leaves Nick with no other option than to break the code of silence by approaching the Assistant District Attorney DeAngelo (Brian Donlevy) and offering him information on his old buddies. A collision between Nick's old lifestyle and the new changed way is not an easy transition. It is difficult on many different levels, but the circumstances do not offer him any luxury with multiple choices. He also realizes that an old acquaintance Tommy Udo (Richard Widmark) has climbed high in the criminal hierarchy though his ruthlessness that displays neither guilt nor compassion. Richard Widmark's brilliant performance seems to be a crossing between the Joker and Hannibal Lecter, and it helps to enhance the suspense in the film. Through his connections Nick reunites with Tommy with the intention of entrapping him on the behalf of the law. However, Nick is also conscious about the possible dangers that Tommy might pose, if the law does not succeed in convicting him. Nick's situation portrays a sad story of social biases and the society's unforgiving approach to criminality without regard to the circumstances. The film also presents a sense of meaninglessness in regards to criminal law when it cannot provide safety to the innocent. In addition, the film allows the audience to reflect on how truly blind the law is in regards to who requires safety and who gets it, as it touches on the shadow of the American legal system. Very effective direction, beautifully constrasted photography and solid acting make this one an instant classic. Widmark is terrific as a hand-gun on the psychotic side (his breakthrough role) and Mature is dead-on as Nick Bianco : manly, natural, a tough-as-nails-with-a-soft-spot kind of character that suits him perfectly. "... And I got what I wanted. I got Nick." Kiss of Death starring Victor Mature is reportedly supposed to be a landmark noir film. It's certainly not the best example of what noir has to proffer, but it does succeed in offering up a marvelously Machiavellian performance by Richard Widmark. It's just a pity that the film lacks dramatic tension and by today's standards it has a little less impact than perhaps it once did. In fact, the whole affair comes across as a little dated and rather perfunctory - the dialogue is not something that would ring true today, and besides Wydmark's nasty turn as a sadistic killer, the acting for the most part is quite weak. Filmed on location in New York, Victor Mature plays Nick Bianco, a small time crook, who is incarcerated for 20 years for robbing a jewelry store. District attorney Louie DeAngelo (Brian Donlevly) out of sympathy for Bianco's two young daughters, gives him a chance to go free but only if he will blow the whistle on his accomplices. Stubbornly adhering to the "code" of thieves, Bianco refuses to do so, until his wife kills herself and his kids are placed in an orphanage. Once paroled, Bianco is prevailed upon to extract additional information from sadistic mob boss Tommy Ludo (Widmark). Living with his children under an assumed name, Bianco gradually divests himself of all criminal tendencies, and falls in love with sympathetic Nettie (Coleen Gray). But Bianco feels that it's only a matter of time before Lido will come gunning for him, so he goes back to DeAngelo offering to turn over evidence that will send Lido up for life. But it's all too little too late, and Bianco suddenly realizes he is doomed. Kiss of Death is pretty much an automatic and dutiful gangster film. With the last five minutes, being probably the best and most tense, as Bianco undertakes -a cat-and-mouse showdown and ultimate shootout with Lido. But it is the presence of Richard Widmark that elevates this film above boredom inducing and his evil turn as Udo more makes up for any of the script's banalities. The scene, in which he gigglingly pushes a wheelchair-bound old lady down a flight of stairs, is still ruthlessly brutal even today and it's easy to see what made the film notably notorious on its release in 1947. 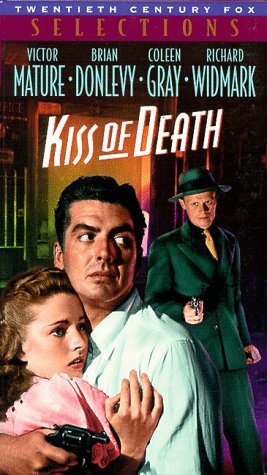 Kiss of Death's biggest weakness is the casting of Victor Mature as Bianco, and you get the definite sense that although he's trying too hard to be a serious "actor" especially in the quieter scenes with Coleen Gray, but he's just okay under Henry Hathaway's careful direction. Nick Bianco is a sympathetic character and a memorable crook with integrity. Brian Donlevy is dependably monotone but also comes out acceptable. Fox starlet Coleen Gray never made top star status but appeared in scores of memorable parts, is also "just Ok" as Nettie. Mike Leonard December 05. Nick Bianco, played by Victor Mature, is a small-time hood who cannot get a break in honest society because of a past criminal record. Married with two little girls he robs a jewelry store and is caught. Facing hard time of up to 18 years he refuses an Assistant DA's(played by Brian Donlevy) offer to turn state's evidence and receive a lighter sentence or possibly parole. There is no way that Nick will be a "stoolie." While in prison, though, his wife commits suicide in despair and his two little girls are placed in an orphanage. The shock and anger over his wife's death and his childrens' plight change Bianco's mind about cooperating with the DA's office. He gives them information about several cases that win him a parole. This 1947 film noir is famous among film fans for the fantastic debut performance of Richard Widmark as the psychopathic killer Tommy Udo. The unforgettable scene of his pushing a woman in a wheelchair down the stairs while braying his famous and inimitable snarling laugh has been shown countless times for its shock value. It still shocks today, even in our violence-desensitized society. Udo's nasal-toned "big man" contempt toward a better class of people, and Bianco in particular at the end of the movie, is another classic acting invention that Widmark created for his Oscar-nominated role. After Bianco testifies against Udo, and Udo walks anyway, it is only a matter of time for the violent denouement that ends the picture. I found Victor Mature's performance surprisingly solid and low-key. It is a far cry from his later stereotype as the outsize overactor required in "Samson and Delilah," "Demetrius and the Gladiators," and "Hannibal," which are wonderful viewing for the 8-12 year crowd. He is right for the Bianco part. His acting is controlled and subtle. He is convincing as a film noir hero; a basically good guy who cannot catch a break. His redemption comes, of course, through righting a wrong. Brian Donlevy does his usual solid acting job as the Assistant D.A. Coleen Gray is sweetness and light as the babysitter who becomes his second wife and a key player in Bianco's rehabilitation. She does a nice job of narration as well. Karl Malden has a bit part as one of the detectives in one of his early performances. Widmark's performance is classic, but the movie itself is well worth seeing for its suspense and fast-paced plot. Ben Hecht was one of the screenplay writers. That is always a good sign that the movie will have crisp dialogue. Buy it if you like film noir and good moviemaking. Richard Widmark, always known for his wit, had a line like no other when it came to his highly successful transition from radio drama to film. The slender blonde actor had secured a major niche as a radio performer in the early post-World War Two era, leading him to quip after being asked to transition his talents to film, "I'm the only actor who gave up a home with a swimming pool to go to Hollywood." While others went to Hollywood in search of riches, including a swimming pool, standard fare for affluent performers in warm and sunny Southern California, Widmark left his posh Long Island home and swimming pool behind when he went to Hollywood. The trip west proved worthwhile for him as well as moviegoers. The irony was that, while he ultimately moved to Hollywood, his first cinema effort, which resulted in film immortality, the 1947 film noir gem "Kiss of Death,"enabled him to commute to work from his Long Island home since director Henry Hathaway set it almost entirely in the authentic New York location settings embodied in the story, which was drawn in part from a true life account. The film represented noir at its most convincing and Widmark at his most chilling. Filmed in convincing black and white and including prison sequences shot at Sing Sing Penitentiary, Widmark as psychopathic killer Tommy Udo stamped an enduring presence on the cinema world with one of the most brutal and graphic scenes in history. It comes when he pushes Mildred Dunnock, cast as the mother of a mob partner that the criminal suspects of squealing on him, down a flight of stairs. Equally notable was the fact that this film made Widmark's sadistic and sardonic laugh every bit as big a trade mark of cops and robbers suspense films as George Raft tossing his legendary coin. As Widmark would be the first to acknowledge, for him to garner such accolades from his first role it took a great team effort, and delivering a consummate performance, as Udo's onetime friend and ultimate enemy, was Victor Mature. As a handsome Twentieth Century-Fox contract player with a great physique Mature was frequently downplayed as beefcake. His sensitive portrayal of a stickup artist seeking to go straight revealed that he was far more than a handsome leading man for the likes of Betty Grable in light studio musical fare. Initially Mature spurns assistant district attorney Brian Donlevy's effort to extract information from him in exchange for a lesser prison sentence, sticking to the criminal code of refusing to cooperate with authorities. Even after Donlevy appeals to Mature's family side as a husband and father of two young girls he is initially undeterred. Mature changes his mind after spending some time at Sing Sing. The glib mob attorney, played by veteran Broadway stage actor Taylor Holmes, fails to follow through with his promise to get Mature a pardon through pulling strings. In the interim Mature's wife is beset by poverty, becomes depressed, and kills herself. The young daughters he deeply loves are then placed in an orphanage. His cooperation with Donlevy nets Mature an exit from Sing Sing. He ultimately takes a regular job and marries Colleen Gray, who had been his children's former baby sitter. Just when things appear to be going well and Mature has adjusted to the life of a lawful citizen the moment occurs that spin the story toward its ultimately suspenseful conclusion. A previously confident Donlevy calls Mature with some bad news. He had cooperated in a case to nail Widmark on a murder rap, but Taylor Holmes' skillful defense cast enough doubt in the minds of the jury to result in a not guilty plea, which set the psychopathic killer back on New York's streets. Mature realizes that he has more than himself to be concerned about, fearing that the vengeance-minded criminal and his mob will target his wife and children as well. The drama swings into high gear when Mature plots a strategy to confront Widmark and resolve their differences. At one point he clashes directly with his old benefactor Donlevy, who asks him to accept police protection and let authorities nail Widmark. Mature and Widmark hold a tense meeting near the film's conclusion that brilliantly contrasts their styles. Mature exhibits a steely determination while Widmark waxes sarcasm and delivers his trademark laugh. The action spins to a final conclusion amid much tension, leaving audiences spellbound and awaiting final resolution. This is one of the MOST superb and enigmatic titles of the Noir Film in any age. After being twenty long years in prison, Victor Mature must infiltrate gang run by the psychopath Richard Widmark who simply ignites the screen with his mercurial performance This is the famous film that offers the brutal and merciless sequence in which gleefully pushes a wheelchair-bound. woman to her death downstairs. This is to my mind the glorious contribution of Henry Hathaway in this genre. Not too long ago, in the movie Silence of the Lambs, Anthony Hopkins took his small role as Hannibal Lecter and stole the show. Though on the screen for only a small portion of the film, his character was so compelling in its villainy that the rest of the film sometimes seems to exist only to fill time between his appearances. But decades before Hannibal the Cannibal, there was Tommy Udo. Udo is the psychopath played by Richard Widmark in Kiss of Death, and though he is (like Lecter) only on screen briefly, he dominates this movie. Udo is a nasty character, even more so when you consider this movie was made in the 1940s when the Production Code softened most of the edges in Hollywood. Though we only see him commit two real acts of violence in the movie, both are done with such gleeful brutality it is well understood why other characters fear him. And none dread Udo more than Victor Mature's Nick Bianco, the main character in this movie. Nick is a petty crook whose bad luck at the movie's beginning lands him in prison once again. Given the opportunity to reduce his sentence by ratting out others, he chooses silence, impressing his jailmate, Udo. Eventually, circumstances force Nick to barter for his freedom, and part of the cost is eventually testifying against Udo, an act that will bring peril to both Nick and his family. This is classic film noir, with an antihero lead, plenty of crime and dark, seedy settings (all that's missing is a femme fatale). In today's suspense films, we often get a happy ending, but there are no such guarantees in noir; we don't know Bianco's ultimate fate, and far be it from me to reveal it here. If it's a little tame by today's standards, it still is a good, solid movie, maybe not perfect (Mature is a bit stiff as an actor, which just makes Widmark shine more), but clearly four-star material. While some of the Fox Noir releases are borderline noir at best, this one is a worthwhile addition to the collection for fans of this genre. This was a 1940s film noir with a little bit different slant: the main character "Nick Bianco" (Victor Mature) being a caring father. Here's a guy torn between being a crook most of his life and the damage it did to him mentally, but at heart a real softie who is desperate to go straight and just be a regular family guy with everyone leaving him alone. In the story, he turns "stoolie" so he can earn that freedom and be that family man. Among film noir buffs, however, this film is noted more for Richard Widmark's debut as the sadistic "Tommy Udo." One of the most famous noir scenes of all time is "Udo" throwing an old lady in a wheelchair down a flight of stairs! Widmark puts on a fake pair of choppers giving him an exaggerated overbite to go along with his insane little giggle. He also calls everyone a "squirt." His over- the-top performance puts a lot a spark into this film which, otherwise would have wound up more as a melodrama. Strong performances by Widmark & Mature can't save this slow paced film with a highly improbable ending. This review is for the 2005 Twentieth Century Fox DVD. Former convict Nick Bianco (Victor Mature) has no luck finding a job, so he goes back to a life of crime and attempts to pull off a jewelry heist with several other criminal thugs. The robbery is bungled and Bianco gets off on a technicality but is forced by the Assistant District Attorney (Brian Donlevy) to testify against his fellow cohorts in crime. Bianco refuses to testify and goes to jail, leaving behind a wife and two young girls. While in jail, he learns that his wife committed suicide and his two girls are now in an orphanage. Nick feels that he has to get out for the sake of his two girls and to avenge one of his former partners in crime named Rizzo, and tries to cut a deal with the Assistant DA. This sets up the rest of the film where Bianco becomes a stool pigeon to gain his freedom, but he later learns it comes at a very high price. The opening of the film, a jewelry store robbery, is very good, but after that, the film goes into a nearly hour long segment with the Victor Mature character haggling with the DA's office and trying to put his home life back together. It's only when Mature teams up with Richard Widmark playing a small-time loser known as Tommy Udo, does the film become energized again. The final scene builds up tremendously to a potentially great climax, but falls flat with a highly improbable resolution to an extremely volatile conflict. Some nice features of the movie included shots on location at various parts around New York City and the surrounding area including Sing Sing Penitentiary. The DVD quality is OK, but far from excellent. Some of the presentation had real quick glitches of poor picture quality, while the rest was very good the vast majority of the time. The sound was adequate. The bonuses included trailers of the movie and six other Fox noir films plus optional real-time commentary by film-noir authors James Ursini and Alain Silver. When I viewed this movie I kept rerunning the part where Widmark pushes the old woman to her death down the stairway. I always in my mind change myself into Widmark and imagine the old woman being my Mother in Law and that really makes my whole week!! Man oh man, that would be so sweet.......but I digress. This is a classic old movie of great quality and I believe it was Mr. Widmarks debut and he played an awesome bad guy with the most wicked giggle you have ever heard. But the greatest part is that the old woman looks so much like "THE BEAST", my Mother in Laws nickname, that it makes it really easy to transpose their images in my minds eye in one of my favorite fantasies!!! !